Building strength from the inside out! All the movements we make in life are initiated from the core, a stronger core equals a stronger body. A stronger body means moving thru life in an easier more graceful manner and not to mention seriously decreasing the chance of injuring yourself. Building core strength isn’t only about getting a six pack or a V, though those things will happen if you eat right and exercise. But core strengthening is a dynamic process in which we develop strength as well as mobility throughout the torso through a variety of functional movements and exercises. For this challenge we will start with some very basic exercises and in a couple weeks I will follow up with a more dynamic, active set of exercises for more of a challenge. Start here, go for 7 days, check in with yourself to see if anything has changed in the way you feel and move and then do it again!! Wether you are in the gym on the regular or not working out at all right now, you can incorporate this quick bonus core series into your day or workout. You can do this anywhere without any equipment. Basic stomach crunch- This one is self evident, but make sure to lift your upper body in a diagonal motion, think of lifting from the chest and not using the neck, a small movement is ok, we are not doing full sit ups. 45 degree leg lift- Laying on your back with a little bend in the knees, start with the legs up in the air just slightly lower than 90 degrees. Slowly lower the legs as far as you can without the lower back lifting up off the floor and return the legs to just under 90 degrees. Keep going up and down through your range of motion in a smooth controlled manner. If this agitates the lower back then start with one kneed bent, foot planted on the floor and perform the exercise with one leg at a time. 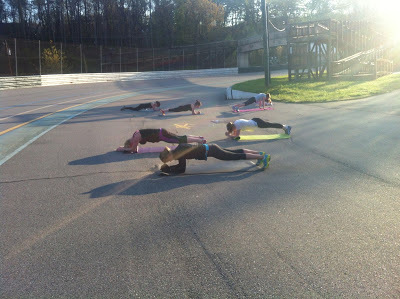 Side plank hip press- From your forearm side plank make a small pushing movement of the hips up towards the sky. Keep your body straight in that side plank! Static plank- simply hold your perfect plank (hands-or-forearms) for at least 20 seconds, work up to 60 seconds or more. Supermans- Laying face down with the hands behind the head pick the chest up off the floor and squeeze the back, lower and repeat. If that isn’t challenging enough then add in lifting the legs as well and squeezing the back as the upper body and legs are up. Imagine a string between your elbows and ankles and its shortening as you squeeze. Make no excuses, get after this challenge every day for 7 days and see how you feel! You may be pleasantly surprised! !